This blog was authored by Henry Mayo, a surveyor and long-time resident of the Bryan-College Station area. As a surveyor and historian, Henry retrieves information from local, state and national resources to assemble history-themed messages for email subscribers in a series titled “This Week in Brazos County History.” To subscribe to Henry’s series, click here. 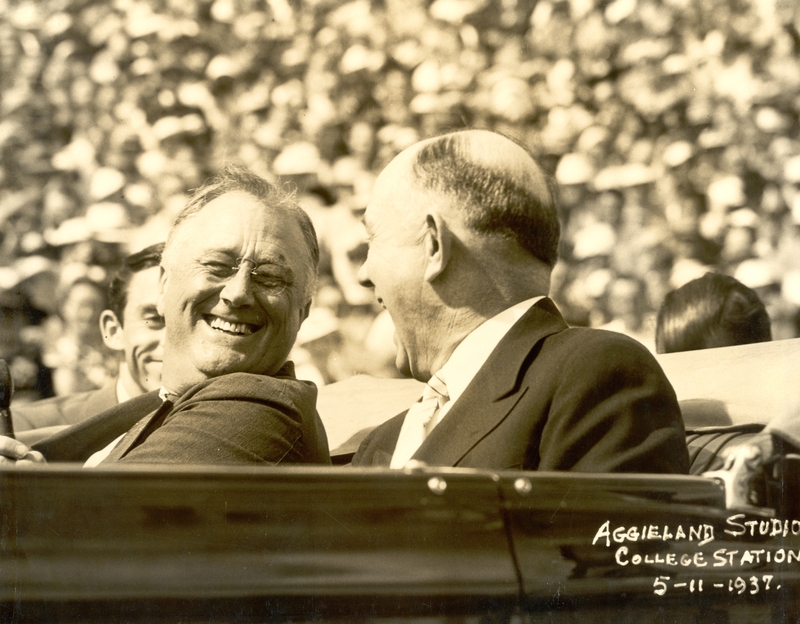 The following photos from the A&M Cushing Library Flickr site capture President Franklin D. Roosevelt’s arrival, his parade to Kyle Field and even him standing at the A&M commencement ceremonies of May 11, 1937. 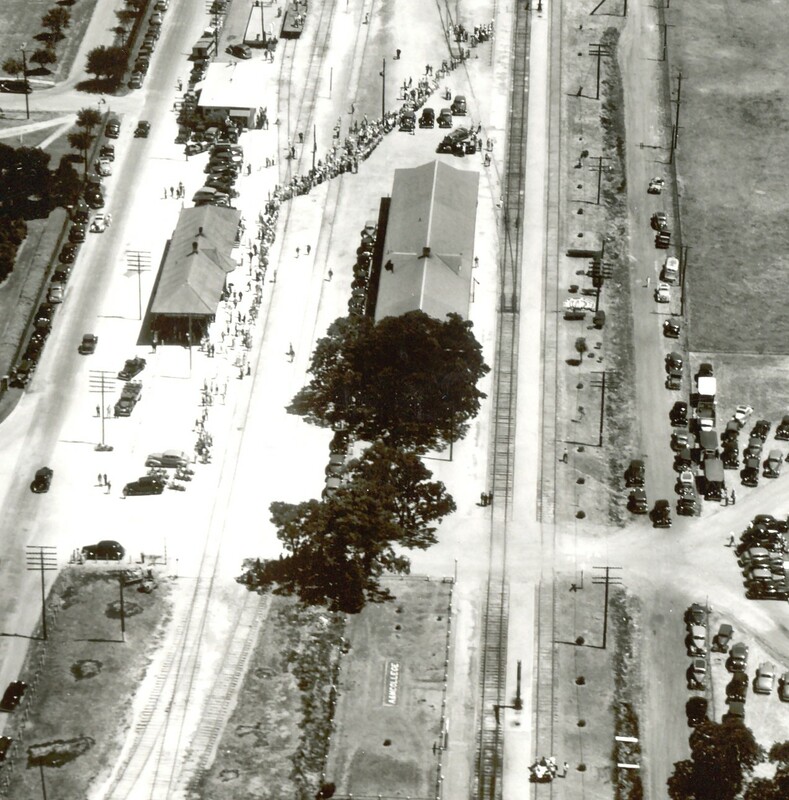 This photo is an aerial view of the two College Station railroad depots, with a line waiting to see the President disembark and ride in the convertible to Kyle Field. I was told that the automobile was also brought in by train. It can be seen just above (south) the Southern Pacific depot. The smaller depot, to the left (northeast) is the Missouri Pacific depot. The current location of Wellborn Road runs on top of the old MPRR tracks and depot. 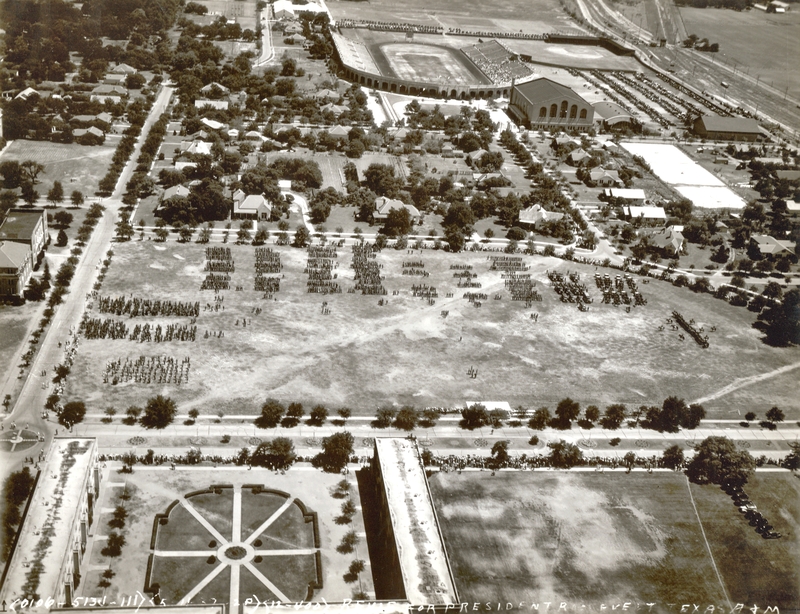 This photo was probably taken within seconds of the previous one, showing corps units in formations on the drill field, lots of cars behind Downs Natatorium and a good many people already taking seats in the west bleachers at Kyle Field. Within a few years, the many faculty homes seen in this photos were moved off campus. The very recognizable face of President Roosevelt. Obviously, he and A&M President T.O. Walton were enjoying each other’s company. Apparently, this shaded stand was built special for the day and included a sturdy grab bar for the President. 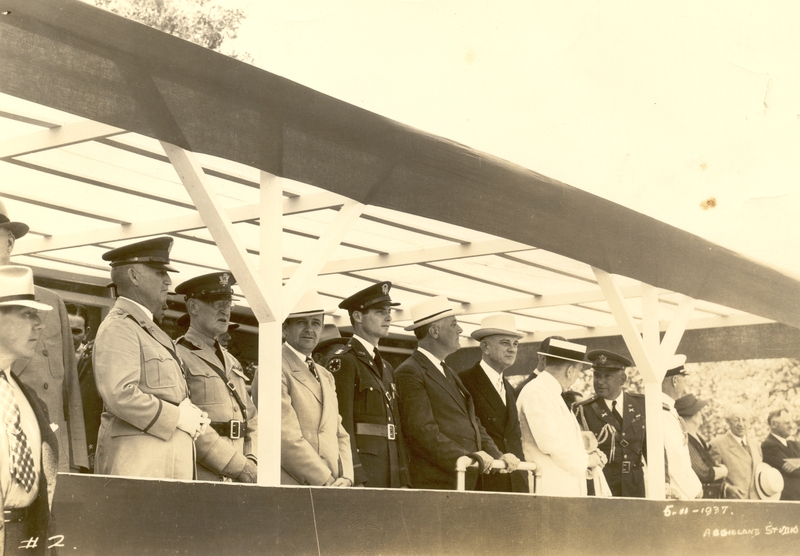 If anyone has information on the other dignitaries in this photo or know of other interesting things related to this presidential visit, please let me know and I will post a follow up. At the time of this visit, FDR was just a few months into his second term, having won by a landslide. The dark clouds of war were not on the horizon yet, FDR’s New Deal had put many people back to work, and America was recovering from the Great Depression. A&M was directly connected to many of these programs, such as the Agricultural Adjustment Administration (AAA), which I mentioned last month. This entry was posted on May 14, 2013 by City of College Station. It was filed under Historic Preservation, Public Communications and was tagged with 75th anniversary, history.